Sakai Guides and DocumentationTeaching Assistant Guide Customize Your Site's HomepageWhat is Overview? The Overview tool is the landing page for a course or project site. It is the first thing site members see when they click into a site. Note: Site owners have the option to customize which tool is displayed as the course landing page, so in some cases users may see a different tool upon first entering a site. 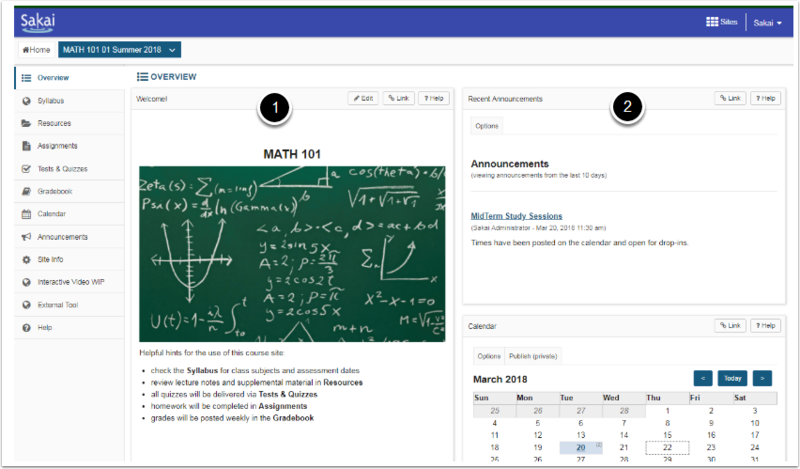 Instructors can personalize the Overview Site Information Display with images, contact information, and course details. When enabled in the site, some tools - Announcements, Calendar, Forums and Messages - will have a synoptic widget added to the Overview page to display recent events in those tools. Prev: How do I control site access? Next: How do I edit the Overview site information display?